Chapter One: Paradox of Self-Interaction Correction: How Can Anything So Right Be So Wrong? 2 What Is Right About PZ SIC? 3 What Is Wrong About PZ SIC? Appendix. Do Complex Orbitals Resolve the Paradox of SIC? 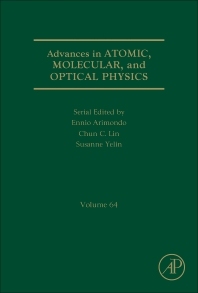 Advances in Atomic, Molecular, and Optical Physics provides a comprehensive compilation of recent developments in a field that is in a state of rapid growth, as new experimental and theoretical techniques are used on many problems, both old and new. Topics covered include related applied areas, such as atmospheric science, astrophysics, surface physics, and laser physics, with timely articles written by distinguished experts that contain relevant review material and detailed descriptions of important developments in the field. Ennio Arimondo is Professor of Physics at the University of Pisa, Italy. In a a long research career, Professor Arimondo has been engaged in experimental and theoretical research related to laser spectroscopy, the interaction of radiation with matter, laser cooling and new phenomena of ultracold atomic gases. Professor Arimondo is a Fellow of the American Physical Society and of the Institute of Physics. He is editor of Conference and School Proceedings. Chun C. Lin is Professor of Physics at the University of Wisconsin – Madison. He has been working in various areas of atomic and molecular physics for several decades. He received the American Physical Society Will Allis Prize “for advancing the understanding of the microscopic behavior of ionized gases through his innovative and pioneering studies of excitation in electron and ion collisions with atomic and molecular targets” in 1996. He is a Fellow of the American Physical Society and has served as the Chair of the Division of Atomic, Molecular and Optical Physics in the American Physical Society (1994 – 1995).